The Smart Energy Inverter combines a hybrid solar and battery inverter with SmartFlow, intelligent energy management software and the Smart Energy Console, a touch screen to give you complete energy infrastructure visibility and control. 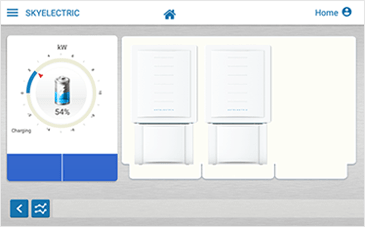 The smart energy Inverter are is cloud connected via built-in 3G/4G and Wifi internet connectivity. This allows the SmartFlow software embedded in the Smart energy inverter to continuously receive information about current and predicted grid tariff along with availability and solar energy patterns. One unit of Smart Energy Inverter ranges in power output from 3 to 10 kW. Multiple Smart Energy Inverters can be connected in parallel to increase the total power output of a Smart Solar System. 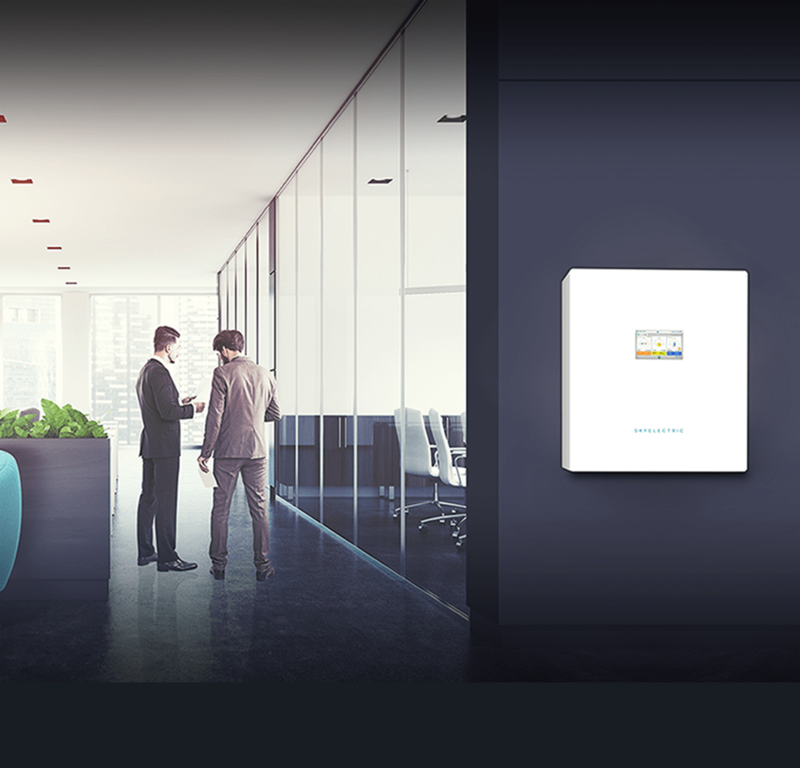 The parallel systems remain part of a single virtual Smart Energy Inverter, controlled by one Smart Energy console while providing visibility over the entire bank of Inverters. In each parallel configuration there is one master that controls the Smart Energy Console and multiple slave inverters that provide additional unit power. 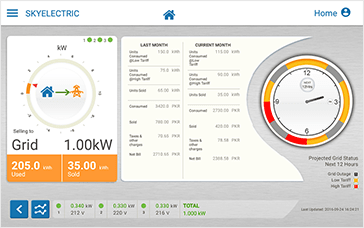 The touch-screen Smart Energy Console provides you with an instant picture of the energy being produced and consumed at your premises. It also provides an up to date view of solar power production and consumption, grid consumption and export, grid availability status, battery status and stored energy levels. 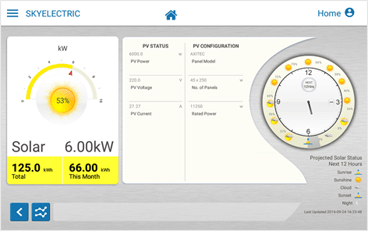 The dashboard, which is the home screen of your Smart Energy Console shows the grid, solar and battery status, along with your current running load. 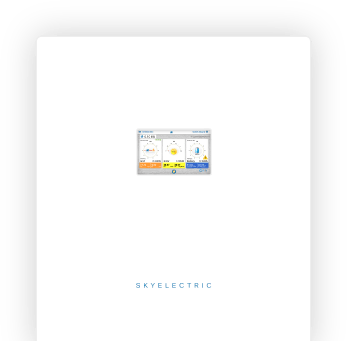 The Smart Energy Inverter has energy metering capability and acts like an energy meter to record all inbound and outbound energy transactions with the main grid (e.g. using Net-Metering). 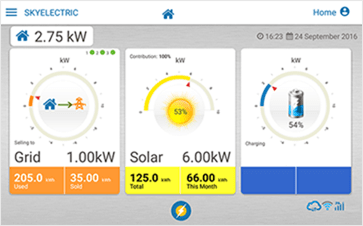 The Smart Energy Inverter gets all the latest local tariff rates from the Cloud and calculates your bill using this information. The Grid Screen shows your up to minute energy bill, projected grid status (i.e. your high-low tariff times and scheduled grid outages) and whether your system is net-metering enabled or not. On the Solar Screen, you have information about current and predicted solar status (using local weather data) and the percentage solar energy predicted at given times through a 12 hour time frame. The dial on the left shows your current solar output as well as the total solar energy produced this month and since time of installation. On the Battery Screen, you can see how much stored energy you have, the remaining charge and backup time left on your battery. The icons represent your battery cabinets and their capacity. 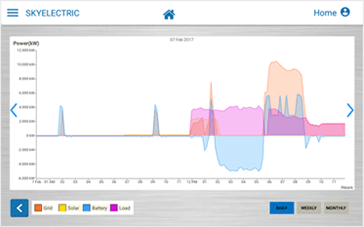 The Smart Energy Console provides daily, weekly and monthly historical graphs to show your load power consumption, battery charging and discharging, as well as grid selling and consumption, and solar production patterns down to the hour.